Not that it means all that much to me but – I did see a advertisement for Hungry Howie’s Pizza which said that JUST TODAY, if you bought a regular pizza with one topping, you could get a second “Leap Day” pizza (same as the first) for only 29 cents! That’s neat! I’ve kind of been ‘out of it’ a bit the past few days – upset stomach, dizzy, headache – just feeling kinda ‘weird’ – we stayed home from church yesterday (I was sorely tempted to go to choir practice but then thought: If it gets worse, who’s going to drive you home?) so I just stayed on the couch. The stomach thing is gone, but still have an on & off headache & occasional dizzy spell – good thing I don’t have anything planned for the day, eh? Spray a 9 X 13″ baking dish with nonstick spray. remaining dough in plastic wrap & chill. pan to a wire rack & let cool about 15 minutes. bowl. Add cream & microwave on High 1 minute. until combined; pour filling over baked crust. it on caramel layer now. serving sprinkle Parm cheese on top. seasonings & remove from heat. smooth (may be a little chunky). small bowl; spoon over bundles. leaving space so they don’t overlap. brown; remove from oven & cool. mixture is easy to form into balls. Prepare brownies accordg. to pkg. mixture carefully over top of cherries. to get another big snowstorm tomorrow/Weds. high winds & low temps of 17 – oh, joy . . .
around the corner, right? I’m HOPING! on the side – just sayin’ . . .
Foolin’ Around . . . 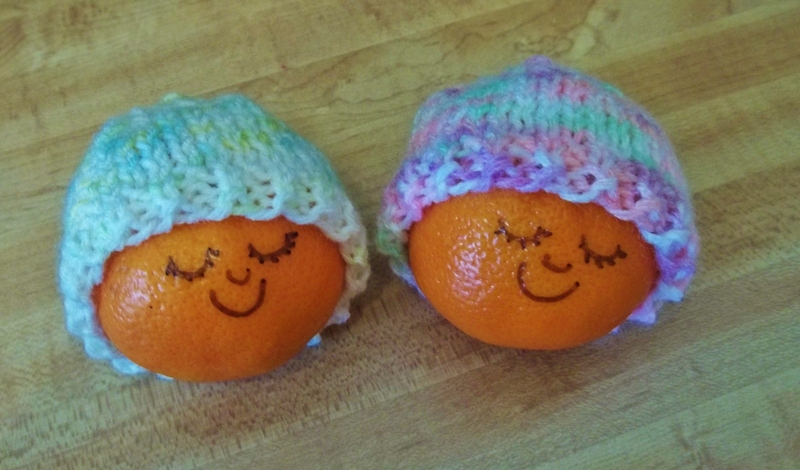 I like to knit early in the morning and today was another two Premie baby hats – these are ‘worn’ by two Halo mandarin oranges-the really small ones. (I tried them on medium eggs but the hats were too big). Almost half done with the red & white striped baby blanket for Crisis Pregnancy Center. Weather-wise it’s around 21 degrees F. no new snow, roads are clear. Saying that, I STILL don’t want to go outside! Tonight is my special needs group’s Gym Night, so I have to go . . .am thinking about taking a quick trip to the grocery store & gas station, just for ‘excuses’ to get me out in it before tonight but I still haven’t convinced myself . . . I turning into a House Troll! mustard & 2 strips Swiss cheese. chopped onions & pour over chicken. Heat a 10″ cast iron skillet with 1 tsp. sauce & season with salt/pepper. potatoes are tender & onions cooked. sliced tomatoes & cilantro & serve. & flour a 10 inch tube pan or 12 C.
wire rack to cool – cool completely. of ice water – soak 30 minutes. oil, garlic & dried rosemary in small bowl. cheese over top & season with salt/pepper. from oven & sprinkle remaining Parm. & 1 whole scallion – cook 10 minuts. stirring with a spoon or chopsticks. you like. Remove from heat. Let dough stand at room temp. a 4 inch circle & top with 1/4 C.
muffin cups, seam sides down. in a ziplock plastic freezer bag. through. Makes 20 meat pies. filling is bubbly & heated through. accept it as it comes, right? ADDENDUM: Just got home from a quick trip to the grocery store to purchase a lovely pot of tulip bulbs for my friend (who’s one of our leaders in my special needs group). The temps have warmed up a bit: 35 degrees F., sun shining and my dear husband cleaned off my car before I left (that’s the ONE thing I was dreading doing, as it was totally buried!). I’m guessing, from reports in our local paper, that we got about 8 inches Wednesday/Thur. morning. The sun is doing a great job of softening up the ice/snow – the roads are totally clear AND DRY! Gas prices were a bit of a shock – they’re up, again: $1.79/9 (last I remember checking they were in the $1.60’s) – I have a half-tank, am going to take my chances & wait to see if they come down some before filling up. Husband asked if I’d stop at our favorite place: Tim Horton’s, so I was very happy to learn that I could ‘cash in’ more than one “Roll-UP-The-Rim-To-Win” redemption in one purchase: got us both coffee AND a free donut (free coffee was the other freebie) – with the Senior Discount, it was something like $1.00 + a little change – YAY, don’t you LOVE discounts? (My frugal little heart does!). Not exactly sure how many ‘inches’ of snow we got but it snowed almost ALL day yesterday – roads were very hazardous/driving was very slow (our two boys had to drive home in it). Today we were supposed to get up to 2 inches more, but it just lightly snowed in the morning and now it’s stopped. It’s only 30 degrees F. out and is not going to get much better until Sunday when it’s predicted to get to 54 degrees – that’s enough to start melting what’s out there. We fared well – lots of food in the house, warm clothes/warm house so we were blessed. 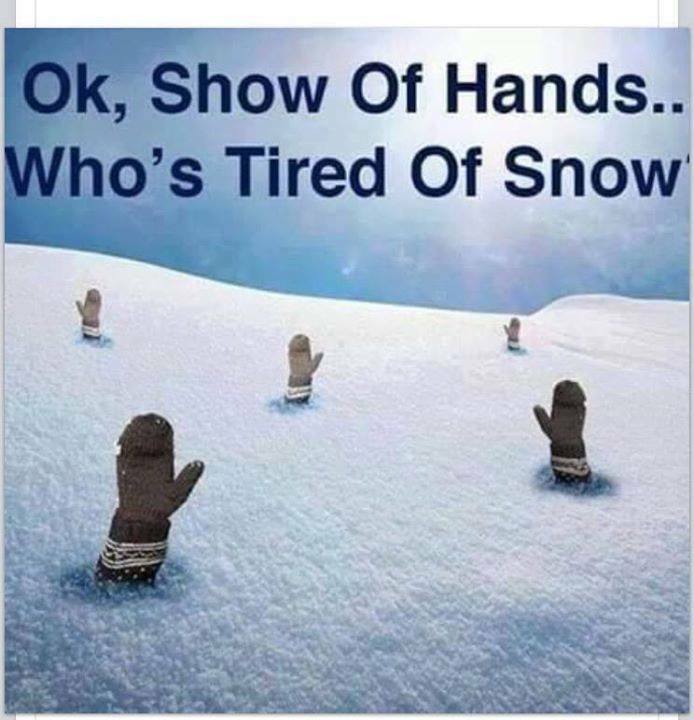 I don’t have any plans for going anywhere until tomorrow evening when my special needs group is having a Gym Night – am really hoping the roads will be VERY clear (they are, now). 1 T. sugar & remaining cinnamon. from oven & let cool 10 minutes. milk & Parmesan cheese, set aside. with half the diced ham – repeat layer. Parm. cheese) – dot with butter. place under broiler for 3 minutes. are golden brown. Makes 1 loaf. thickened & become glossy; remove from heat. 15-20 minutes until tops start to brown. minutes until top is golden. if it’s just taking a 10-15 minute nap! 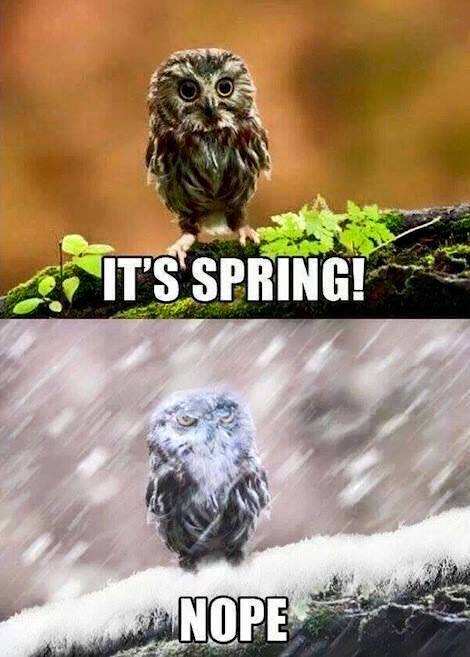 Right now we’re under a Winter Snow Warning – hazardous conditions: up to 5 inches due this afternoon, another 4 tonight, 2 expected tomorrow – yep, it’s Michigan! 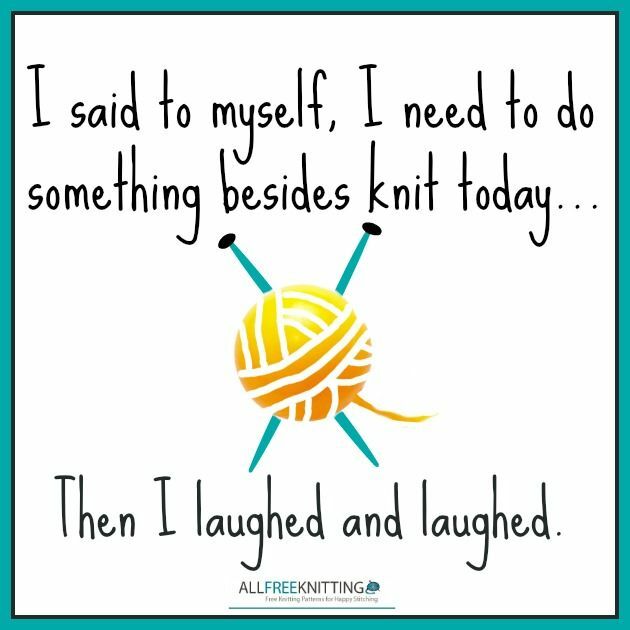 Just spent about 1 1/2 hours calling/texting/emailing & Facebooking all the special needs group members/group homes and also canceling my deliveries of the baby blankets & big bag ‘o yarn – NOT a good time to be ‘out & about’. My boys are working today; good thing the middle son is working in the office today and NOT on the back of a garbage truck! Youngest is working a double shift at his restaurant where he’s currently Garmage (salad guy) and dishwasher. Husband just decided to take a ‘quick run’ in his Jeep to keep it running right (he only drives it about once a week). Good thing? He’s also stopping for coffee at Tim Horton’s & to Burger King for Whopper Juniors for he & I for lunch! (Yep, I’m spoiled . . . sometimes!). & corn – top with mashed potatoes. Beat 2 pkgs. cream cheese, gran. elec. mixer until well blended. Bundt pan or 10 inch tube pan. blended; drizzle over top of cake. & sprinkle top with breadcrumbs. & cook 6-8 hours until meat is tender. Remove roast & cover to keep warm. liquid to a saucepan – bring to a boil. in a thin layer in a 15 X 10 X 1″ baking dish. occasionally. Crumble while warm; cool. from freezer 10 minutes before serving. high heat, combine all ingredients. a meatloaf big enough to fit in a 9 X 13″ dish. meatloaf with potatoes & bake 350 degrees F.
return to oven until cheese melts – simple! Tuesday again . . .
Another ‘nothin’ special’ day – did a quick trip to White Lake (about 15 min away) to get another printer ink cartridge for the last of the special needs group’s newsletters for April/May. Did a stop at the drug store for some of their good buys (Tide on sale for $5.98 – and I had a $2.00 off coupon! ), my instant coffee on sale $3.99 – normally $5+, Mountain Dew 99 cents a bottle, limit 4 (I love getting that on sale – husband drinks it constantly and, not on sale, it can run $2.09 a bottle!). Grabbed a few quick groceries and got home in good time. Still have some ‘leftovers’ in the fridge – not enough for a meal for several people, but still ‘some’ spaghetti, ‘some’ fried fish & mac & cheese, still ‘some’ pierogies & sausage. I ‘was’ going to cook dinner tonight, but now that I think about it – that’s enough for us, each person getting one of those things! Weather report says we’re in for a big snow storm soon (I didn’t know) – it’s a pretty big possibility I might be spending a few hours calling all the special needs kids to tell them we’re canceling tomorrow night – I await our leader’s call on that one. With that hovering over my head, I’m tempted to rush getting the newsletter done, folded, stuffed into envelopes & trucked to the post office TODAY! Tomorrow I’m supposed to meet with the lady in charge of Crisis Pregnancy’s Mobile unit to drop off 5 baby blankets – but that can wait if the weather is nasty. Tomorrow at 4 p.m. I’m supposed to meet the lady in charge of the group that donates hats/scarves/gloves/mittens to the homeless to give her a 30-gallon bag full of yarn – we’ll see on that one, too. (She lives about 1/2 hour away, so we try to coordinate a ‘pick up’ spot kind of in the middle). All things being ‘relative’ – we’ll see what tomorrow’s weather brings! I have to make a note here – our pastor’s daughter made this pie once and I’m telling you: It’s TO DIE FOR!!! Beat eggs slightly in medium bowl. & salt; stir in pecans & chocolate chips. on top. Cool before serving. a large pot of water to a boil. drop into rapidly boiling water. Cover & cook about 15-20 minutes. to coat. Refrigerate 30 minutes. halfway through until cooked through). crockpot & place chicken on top. 10-15 minutes. Remove & serve hot. coat entire bottom of dish. dish & pour remaining sauce over top. to oven 5 minutes for cheese to melt. serving remove bay leaf & stir in 1 T.
hour of cooking if they are still too firm. longer to cook before becoming tender. not affected, just stir well to blend. browned. Cool on wire rack. Last night we had a really big wind (55 MPH +) for most of the night (our lights flickered once, but stayed on – YAY!). Woke up today to NO SNOW – anywhere! It’s now 56 degrees F. and sunny; a GREAT day – love seeing the sun. Started working on another baby blanket for Crisis Pregnancy center – this one is rather ‘basic’ – just red & white stripes, but it’s easy to work on without really ‘thinking’. brown sugar & cinnamon – mix well. & sprinkle tops evenly with nut mixture. bowl with 1/2 T. of spice blend. chops. Add bay leaves to crockpot. 5 minutes – taste & add about 1 tsp. over hot rice, potatoes or pasta. until batter is evenly distributed. Fry 2-4 minutes on each side. Makes 2 large or 4 small. to your desired consistency. Stir in 2 T.
Greek yogurt & 1/2 C. shredded cheese. minutes until meat is browned. powder, sugar, salt & 1/4 tsp. combine egg & buttermilk; mix well. In a third dish mix remaining 1/3 C.
pan to 350 degrees F.
batter, mixing well to remove any lumps. Dip apple rings, one at a time, into batter. pepper & transfer to 4 qt. crockpot. with sour cream, if desired. It’s now around 54 degrees F. – sun shining and most of our snow is melting – YAY! Looking at the next few days we should be seeing somewhat the same temps, a little cooler, but not by much. It’s ALWAYS nice to look forward to warmer weather. I still have two more of her test rectangles – not exactly sure just when I’ll tackle another one. Right now I’ve started a very simple red & white striped baby blanket for Crisis Pregnancy center. 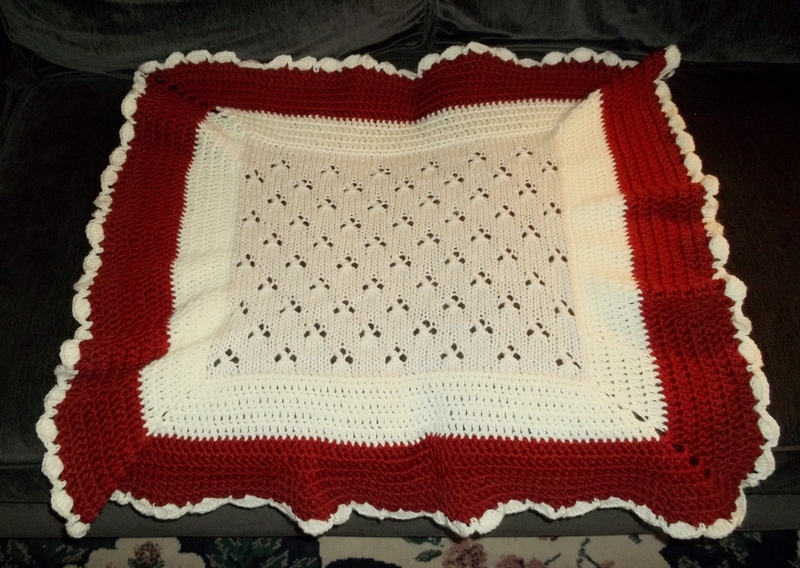 I’m thinking the above afghan will be my first donation to the Detroit Veteran’s Hospital Baby Shower in September. parsley & cook 5 minutes longer. Not yo Mama’s Tuna Casserole! 8 oz. wide egg noodles, cooked accordg. cooked noodles & tuna until combined. with foil, for about 20 minutes. milk & salt; pour into pastry. Prepare & bake quiche; cool completely. in oven until heated through. crust & refrigerate about 15 minutes. In large bowl beat egg; add 1/3 C.
& mix well – shape into 1/2 inch balls. in batches. Remove from pan; drain. remaining salt to pan; stir until smooth. Gradually stir in water & bring to boil. thickened. Add potatoes & meatballs. Serves 8 – about 2 quarts. together & spoon into pears. $1.73/9 . . . WOW! Today was my “Get it DONE!” day – delivered 30 baby hats and the two miscarriage blankets to the hospital and a 30-gallon garbage bag full of yarn to the Senior Center to go to Children’s Village (they teach the teens to knit & crochet). Dropped off some books at the library and checked out four more (that’s about my limit – 4 books/3 weeks). It’s a grey/gloomy day out but the roads are clear – temps around 27. I noticed gas prices are at $1.53/9 right now. Yesterday found me comping up the special needs group’s newsletter – almost done with that and ready to print soon. It’s not ‘technically’ due out until beginning of March but my ‘kids’ will start calling me around the end of this month wondering where their newsletter is, so it’s just easier to get it out a little early if I can. each: bananas & graham squares. 2 minutes until thickened; reduce heat. cook & stir 8-10 minutes until tender. cheese in a bowl; mix thoroughly. dough into 1 inch balls. removing to a wire rack to cool. Hope your day is going just GREAT! small bowl until thoroughly combined. salt/pepper & let cool 5 minutes. Brown pot roast in olive oil in Dutch oven. is tender. Serve with cooked noodles or rice. are tender. Add spinach & heat through. dissolved. Stir in cold water. thing is: IT’S SUNNY! (the above temp. was at 8: 40 a.m. – it’s now 1:30 p.m.
and we’re up to a balmy 14 degrees F.
with a wind chill that feels like ZERO! 7:15 p.m. – I’m sure it will be MUCH colder). starts even in really cold weather! Keep warm, rest a little & enjoy your day! 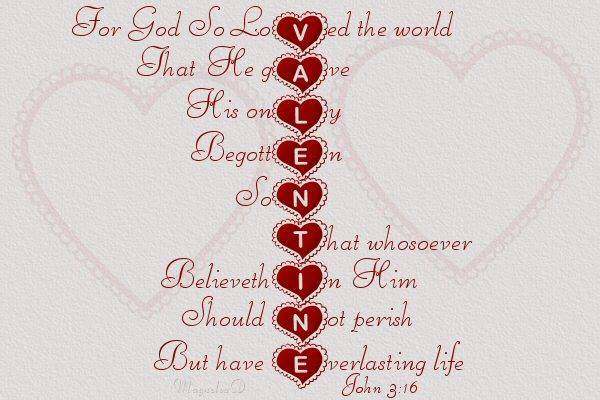 It’s a little early, but so true! Today finds us with lovely sunshine and low 20’s temp-wise. If I don’t have to go out in the cold, I love seeing the sunshine through the windows – cheers me up! (sauce will thicken slightly as it cools). Cut steak into 3 inch wide strips. pound meat into 1/4 inch thick slices. steak & veggies until all steak is rolled up. vegetables, bouillon, parsley & pepper. & lemon peel; sprinkle over fish. bake 15 minutes longer, uncovered. pour mixture into a 3 qt. baking dish. buttermilk & eggs in another bowl. even layer using back of a spoon. is golden brown, about 30 minutes. into a 2-Cup measuring cup. Beat first 6 ingredients using elec.